The Bruins outplayed the Capitals in this one, winning most statistical categories with the exception of the one that matters most, the final score. Alex Ovechkin would score a pair of goals for a 4-2 Capitals win. Braden Holtby was stellar in goal. The Bruins have now lost to the Capitals 14-straight times. The Capitals are back in action on Saturday when they host the Columbus Blue Jackets at Capital One Arena. Puck drop is set for 7:00 PM ET. The Capitals struck first with another break away goal from Jakub Vrana for a 1-0 lead at the first intermission. 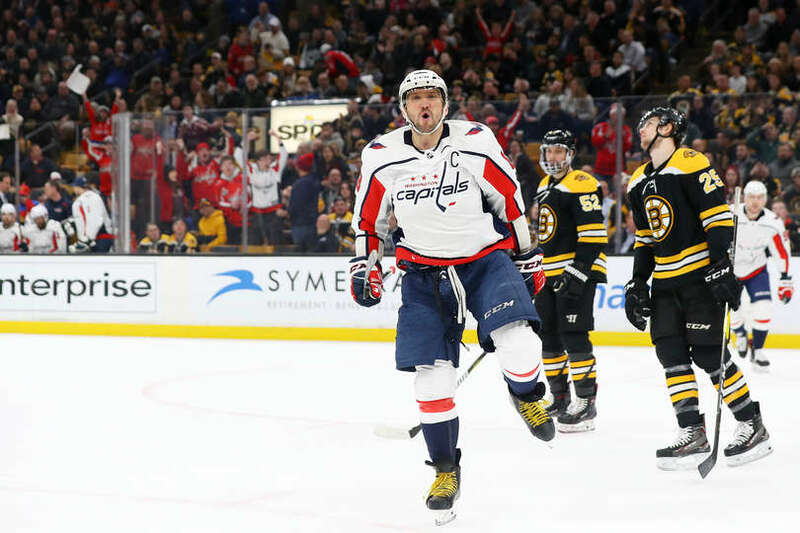 The Bruins would tie the game with less than six minutes left in the middle frame, but Alex Ovechkin would restore the Capitals lead less than a minute later to give the champs a 2-1 lead at the second intermission. The Bruins would tie the game with a power play goal five minutes into the final frame, but Nicklas Backstrom would answer a minute later to give the Capitals a 3-2 lead. Alex Ovechkin would add an empty net goal for the 4-2 final. Scratches: Andre Burakovsky, Madison Bowey and Dmitrij Jaskin. Boston entered the contest ranked 8th in shots per game (32.9) and the Capitals were ranked 23 (29.6). 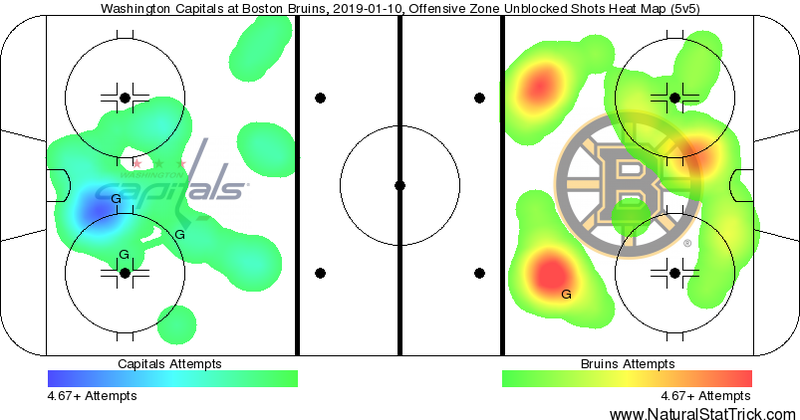 The Bruins entered the game ranked 13th in most shots allowed per game at 31.4 shots per game and the Capitals were ranked 11th at 32.2 shots per game. The Bruins dominated the first period, but the Caps held a 1-0 lead. The Bruins out-attempted the Capitals 18-7, turning it up after the Capitals goal. The Bruins led in shots on goal (SOG) 17-5 after 20 minutes of play. The Bruins led in shot attempts 16-11 and led in SOG 11-7 for the middle frame. The Bruins would continue their shooting rampage in the final frame, out-attempting the Capitals 21-12 and led 13-10 in SOG. 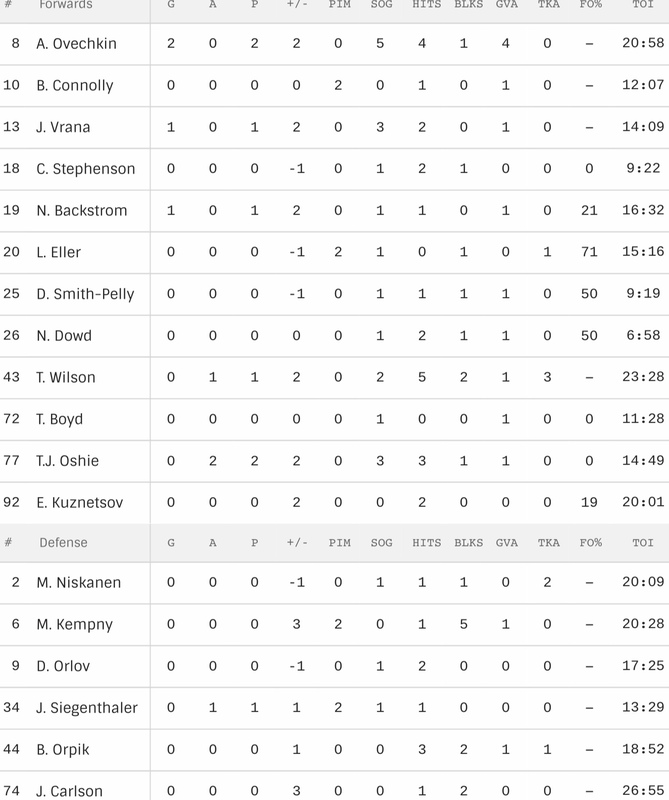 For the game, the Bruins out-attempted the Capitals 55-30, and 41-22 in SOG. Braden Holtby was once again stellar against the Bruins, stopping 39 of 41 shots he faced for a .951 game save percentage. Jaroslav Halak stopped 18 of 21 for a .857 game save percentage. The Capitals were once again shutout on the power play, going 0 for 2. The Bruins were 1 for 5 on the man advantage. The Capitals were once again trounced in the faceoff circle, losing 66-34%. Chandler Stephenson was 0 for 1, Nicklas Backstrom was 3 for 14, Lars Eller was 10 for 14, Devante Smith-Pelly was 1 for 2, Nic Dowd was 4 for 8, Travis Boyd was 0 for 3, T.J. Oshie was 0 for 1 and Evgeny Kuznetsov was 4 for 21. Nicklas Backstrom regained the lead with his 11th goal of the season. The Capitals are 21-0-0 in games where Backstrom records a point against the Bruins. Braden Holtby stopped 39 of the 41 shots he faced tonight (.951 save percentage) and has stopped 62 of the last 66 shots he’s faced (.939 save percentage) over his last two games. Alex Ovechkin scored twice to boost his career totals to 639-532—1,171 and surpass Bobby Hull (610-560—1,170) for sole possession of 50th place on the NHL’s all-time points list. Ovechkin also registered his 128th career multi-goal game to move past Mike Bossy (127) and Jaromir Jagr (127) for the ninth-most performances in NHL history. This entry was posted in News and tagged Alex Ovechkin, Boston Bruins, Inside The Numbers, Jakub Vrana, Nicklas Backstrom, Washington Capitals. Bookmark the permalink.